The Converse Blog: The Converse Blog's Weapresent Weapon Wednesday! Welcome to the Converse Blog's Weapon Wednesday. Today is all about Weapresenting. I mentioned last Thursday about the Weapresent Boston T-shirts, well thanks to Paul, one the fine people at Converse I have some shirts to Weapresent to you today. Oh, before we get to the goods, go check out CelticsBlog.com, they have this awesome Weapresent banner. Below are the two Weapresent Boston shirts, the white shirt is sort of distressed and extremely soft, very nice. They also have the Chevron and Star on the back of the shirt as you will see below. After that you'll see the Green Weapresent Boston Shirt. 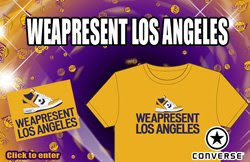 Also I just found a picture of the Weapresent Los Angeles shirt from KLAC's website. Even more Weapresent goodness below. In the recent press kit on the "My Drive Thru" song, they have profiles from some other recording artist, this shot features Chad Hugo of N.E.R.D., Kid Sister, and Frank Carter from Gallows. It is in this shot that Chad Hugo is wearing a Weapresent Virginia Beach shirt, very cool. Hopefully this means more Weapresenting past the finals. Well that's it for today, thanks for stopping in and please remember to vote on your way out. Derrick Rose is starting to pull ahead of Beasley and Mayo. I am off to the Ichthus Music festival tomorrow so I may or may not be able to post on Friday, or I may post tomorrow before I leave. You'll just have to come and see. Hi! I live in Spain and here there is not the Timothy Lile model (4008246). I wanted to know where I can find it in Europe. Are there webs of converse-France, converse-Italy or converse-Portugal? I didn't find them. Thank you. Mi mail is rafasantodomingo@hotmail.com, please aswer here. Thank you so much!